INDIANAPOLIS — The Indianapolis Zoo is gearing up for their busy months and they need to nearly fill their guest services department positions. "We are looking in our guest services area for admissions, attractions, our guest experience and phone call, we are greeters at the bird aviaries, we do shark touch greeters, probably about 200, 250 positions just in our guest services area," Lauren Julian, the director of guest services at the Indianapolis Zoo, said. Julian said they are hiring part-time positions to start working as soon as May. She said she is actively looking for about 10 to 30 people per area of her department. "Anybody that wants to have like a good time, kind of bubbly people is what I like," Julian said. "Energetic, people that love coming to the zoo, love being around animals. I mean how many places do you get to walk around and see your elephants, to your tigers, to your flamingos throughout the day." Julian said the Indianapolis Zoo has a fun work environment, great opportunities, and more than a million guests in the park throughout the year. Julian says the guest services positions cater to people of all ages and lifestyles. "People with some crazy availability as well since we are open seven days a week from like 9 in the morning to sometimes 10 at night," Julian said. "We do things even overnight when we've got Zoobiliation that comes around because we have got to flip the park in a day and everything." These jobs in guest services can start as a part-time position that can grow into a lifelong career at the zoo. "I get to hang out with these guys all day," Austin Barker, a zookeeper with the apes at the Indianapolis Zoo, said. "It is quite an exciting job." 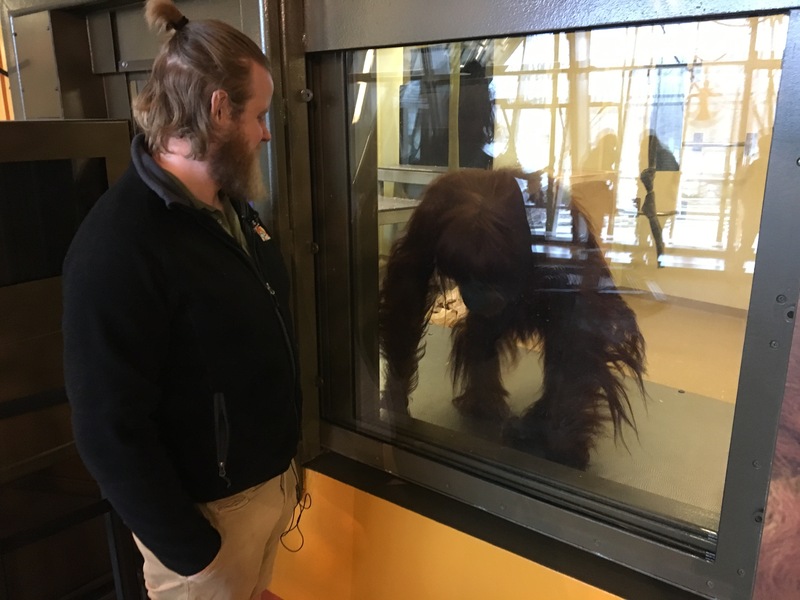 Barker has been working at the ape exhibit for more than three years, but working as a keeper was not always his career plan. "I actually went to school for occupational therapy," Barker said. "I was applying for grad school and needed a part-time job, and I saw the zoo was hiring." Barker took a job with the guest services department nearly seven years ago. "I started out in the attractions, so I was like driving the train, operating the carousel, on the coaster, all sorts of things," Barker said. "I was also part of the grounds crew, so like housekeeping. And I also hung up the Christmas lights during Christmas at the Zoo." This part-time job helped Barker get volunteer and internship opportunities to earn a full-time position as a zookeeper. The positions in guest services require you to be at least 16 years old, some positions have a requirement of at least 18 years old. These positions are part-time and go for up to 29 hours a week. Pay for these positions start at $10 an hour. Some available positions include: admissions cashiers, guest relations team members, grounds upkeep team members, attractions & guest service hosts, and custodians. For complete job descriptions, please visit www.indianapoliszoo.com/jobs-volunteer/available-positions/ . The Indianapolis Zoo only accepts online applications.